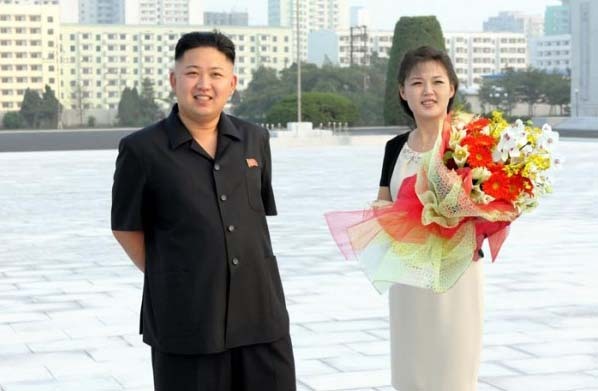 KIM JONG-UNS WIFE IS A FORMER TRAFFIC GIRL! And the sister of recent "Hero Of The Republic" recipient! SEOUL (Yonhap) - Ri Sol-Ju, wife of North Korean leader Kim Jong-Un, had previously been employed as one of Pyongyang's famous traffic policewoman, according to former acquaintances of the First Lady, and has now become a central figure in growing scandal rumors. Sources inside North Korea have recently been in contact with past friends and co-workers of Ri, and are starting to fill in some of the unknowns in her until now sketchy biography. Born to parents counted among the politically elite of North Korea, Ri Sol-Ju began her traffic controller career at the age of 16 and quickly rose to the rank of Captain by the age of 20, the youngest policewoman in the history of the Pyongyang traffic bureau to achieve that rank. Her "superior focus, dedication, and ability to manage unexpected situations" were stated as rationale for such an unprecedented achievement. Her qualifications resulted in various assignments to important state events, one of which led to the meeting of Kim Jong-Un. Additionally, Ri Sol-Ju's talents have not been limited to traffic police work. In 2004 she spent several months abroad studying at a music school in China, ultimately performing as a singer in the Unhasu National Orchestra. She also is a former member of the North Korean cheerleading team of 2005, which accompanied the National track and field team to the Asian Athletic Championships in South Korea. Their first meeting took place in 2008 when Ri Sol-Ju was assigned traffic duty at a state event that Supreme Leader Kim Jong-Il was to attend with his son Kim Jong-Un, who was being groomed for the eventual succession to Supreme Leader. As their limousine arrived at the event, Jong-Un is said to have taken notice of Ri due to her "impeccable appearance, precise commands and great beauty". Several days after the event, Ri was summoned to one of Jong-Un's residences and was formally asked by Kim to accompany him to an upcoming performance of the Arirang mass games as his personal guest, which she of course did not refuse. Details of their "date" remain unknown, but Ri resigned her position as traffic policewoman soon after. They were married in 2009 and currently have one child, a girl, born in 2010. It has recently become known that Ri Sol-Ju happens to be the older sister of Ri Kyong-Sim, 23, who is the Pyongyang traffic policewoman that was mysteriously awarded the title "Hero of the Republic"* in May 2013. The statements made at the time by the state media as to why Ri-Kyong Sim was awarded the title were somewhat vague - they said that she was "defending the revolutionary headquarters in an unexpected situation"; she "secured the safety of the brains of the revolution"; she was "safeguarding the security of the headquarters of the revolution". Here is where the controversy lies - rumors have been quietly growing in Pyongyang questioning the authenticity of the official story. It is whispered that in order to elevate her sisters social status, First Lady Ri Sol-Ju had convinced her husband to arrange the "unexpected situation"(which her sister was informed of in advance) that would then lead to the staged "heroic" action and the resulting regime accolades. Citizens are now wondering if it can just be coincidence that Ri Kyong-Sim has since been frequently seen in the company of regime insiders at various events around Pyongyang. Seemingly following in the footsteps of her sister, Ri Kyong-Sim resigned her position as a traffic policewoman shortly thereafter. North Korea watchers do not expect that there will be any response by the regime addressing these rumors. Unsurprisingly, North Korean sources for this article have expressed their desire to remain anonymous. I want to find a picture of Ri Sol-Ju when she was a traffic controller! As an incentive, I will award an imported North Korean DVD of the movie "A Traffic Controller On Crossroads" to the first person that can find a confirmed picture of Ri in her traffic policewoman uniform. Comfirmed means a credible source that identifies the traffic controller as Ri Sol-Ju. Wikipedia says that Ri was born sometime between 1985 and 1989 - but we know that she started her traffic control career when she was 16, and achieved the rank of Captain when she was 20. She ended her traffic control career in 2008. Therefore, the latest she could have been born is 1988, and probably earlier due to the fact that she was senior enough in rank to be assigned traffic duty at that state event in 2008. So that means that any possible pictures of her in uniform would have to date from between 2001 and 2008, and around 2007-2008 she would be wearing the Captain shoulder rankings. 2001-2007 she would have the lesser rankings, from 2 to three stripes. So I still have not found a picture of Ri Sol-Ju when she was a traffic police woman. But I have discovered two new exciting bits of information about her past. I have found a video that was uploaded to YouTube in 2010 of Ri singing with the Unhasu Orchestra.. If the date is correct, this would have been after she was married to Kim Jung-Un, and she is actually singing "Don't Ask My Name" a famous North Korean Song which is unofficially used as the song of the female North Korean Traffic Police in video reports about them. Here is the video of Ri Sol-Ju singing "Don't Ask My Name"
Ri singing the Traffic Police song has to be more than just a coincidence. More evidence that information in the Yonhap article seems to be accurate. According to wikipedia ( https://en.wikipedia.org/wiki/Ri_Sol-ju ) "North Korean officials are "trying to erase her past as a singer and entertainer by confiscating popular bootleg CDs of her"
I can guess that they also would try to erase her past as a traffic controller, so it may be difficult to find any pictures or video of her from that time. OK, it seems they have scrubbed from YouTube that video of Ri singing the traffic girl song. It has been removed and the user's account closed. BUT... I did some digging around and found a recent South Korean news story about her and there is a short 15 second clip of her singing that song! And the story also dates her as singing the song in 2009. Ha! The North Korean media removal unit didn't find this evidence of Ri's Traffic Girl history to erase! So here is Ri Sol Ju , wife of North Korean leader Kim Jong-Un, in a news story featuring a short clip of her singing "Don't Ask My Name" - the unofficial song of the North Korean Traffic Police! I will keep looking for confirmation on this, new information is hard to find. Never say never. The same performance that was deleted in my post from 2 years ago, and from which a short clip was used in the news story about her that I posted last year. I searched Ri's name in Korean (리설주) and also the song "Don't ask my name" (내 이름 묻지마세요). It was posted to YouTube just under a year ago, which could explain why I couldn't find it last year at this time. (I am downloading a copy just in case this one is deleted too). So here it is again, the complete 2009 performance of Kim Jon-Uns wife Ri Sol-Ju singing "Don't Ask My Name", the unofficial song of the Pyongyang Traffic Girls!